Create your own paper Valentine bear with our cutter files. 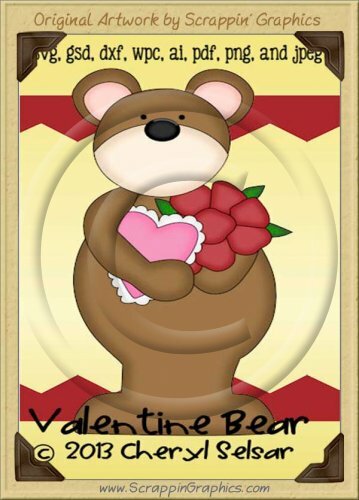 Perfect for all your Valentine paper craft projects, this collection contains cutting project of a cute teddy bear holding a heart and flowers. Use these in Valentine scrapbook pages, card making, paper crafts and much more. Can be used for commercial use but the files cannot be resold. Cutting/Cutter files can be used in their original format, converted into formats compatible to your paper cutting machine such as: Black Cat, Silver Bullet, Craftrobo, Cricut, Gazelle, Klic-N-Kut, Pazzles, ScanNCut, Silhouette, Sizzix, Wishblade and others. All files come with SVG, AI, DXF, GDS, WPC, PDF and JPG format files. Included is a finished project to assist you in assembling the pieces together and PDF file to print and hand cut. Please be sure that the cutting file formats are compatible with your specific software program and/or cutting machine before you buy since no refunds will be given. This collection and 9 others are part of Cheryl Seslar's Cutter Cutting Files Collection . Click here If you would like to purchase this and the rest of clip art in this collect. This product was added to our catalog on Wednesday 23 April, 2014.